When we created THE Dream Machine, our most advanced machine ever, few believed it could be surpassed. However, our visionary designers at Brother never stop dreaming. Now, we bring you THE Dream Machine 2. Enhanced, fine-tuned and graced with refined new features to give serious enthusiasts like yourself an incomparable sewing, embroidery and quilting experience. Are you ready for luxury in every detail? DREAM ON! 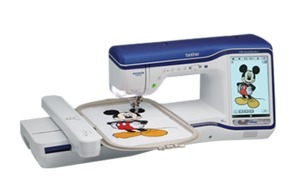 Brother Dream Machine and PE700 Embroidery Only and Simplicity Score Consumer Digest Best Buy Awards. Already Own THE Dream Machine? Click to learn about the available upgrade to receive all the new features found in THE XV8500D Dream Machine 2. Includes 9.5x9.5" Largest Square Hoop. Even More Features: In this video, discover some of the amazing features of the Innov-IS XV8550D, such as the new text alignment feature, grouping and un-grouping multiple letters/designs at once, and making multiple appliques in one hoop! Do you own a camera? Would you like to embroider with photos? Do you own a scanner- how about creating your own designs using a scanning bed on a machine. Did you ever auto digitize your designs using a software program? How about having a machine do it all for you? Create your own stippling inside or outside a design or all over the block the full length of the hoop which by the way is 9.25" x 14". 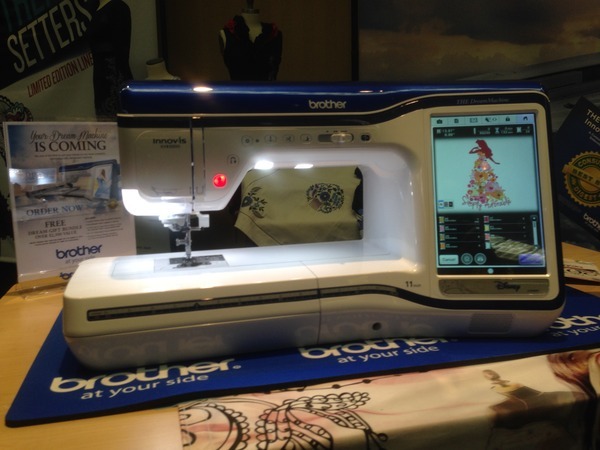 You can even create intricate quilting stitches & designs without software using the new DREAM machine. Your dreams... and ours are made real through a bounty of new and refined features captured in THE Dream Machine™. Our most powerful, technologically advanced combination machine includes 100 new or improved features. THE Dream Machine™ awakens your creativity as it allows you to construct your designs on our largest workspace ever. Dream bigger with our largest embroidery area, create in a wealth of new design and editing options and envision it all with the industry's largest build-in HD display. View your creations in crisp, vivid color and watch them become larger than life with the new zoom function of up to 400% within My Design Center and up to 200% in other modes. Easily adjust your design by rotating in .1mm increments. Larger, more defined crystal clear icons, color navigation, scrolling menu and the ability to view your design properties in preview mode. Built-in HD tutorials make learning easy! View over 40 tutorial videos directly on the high-definition LCD display, or stream your own creations using the industry standard MP4 format. You can even watch videos or listen to music while the machine is not running. 11.25" needle to arm! Our largest needle to arm is a dream for any quilter with the ability to accommodate a rolled king-sized quilt! Enjoy over 56 square inches of workspace. 38% Larger Embroidery Area that previous Models 9.5" x 14"
Engineered for superior stitch quality. Bask in the pleasure of even more precise, high quality embroidery with our most advanced AccuTrac™ embroidery system. Created and used in our multi-needle PR-Series, it provides better under arm support, reduces bounce, provides better stitch quality, as well as sophisticated mechanical changes for the smoothest frame control to date. This industry-first technology gives you a live and up close view of the needle area for the most precise positioning ever. The ability to scan the entire embroidery area provides endless creative options and helps ensure that all of your projects are perfect. We've enhanced our beloved Snowman® Embroidery Positioning Marker to offer more options for alignment of embroidery designs. Pair with the lnnovEye® 2 Technology to automatically position the needle and design for precise embroidery placement. The next generation of My Custom Design has been enhanced to integrate our industry-first InnovEye®2 Technology, offering new design capabilities at your fingertips, all without a PC. Draw or doodle directly on the LCD display, and watch it spring to life in the large drawing area. Or, use the industry-first scanning frame to scan line art, handwriting or printed clip art and have it transformed into embroidery data. There are so many ways to create a custom personal work of art-and a really fun way to create embroidery! The industry's first scanning frame that works directly on your machine. Using lnnovEye® 2 Technology and our state-of-the-art ScanImation™ Scanning Frame, you can scan drawings and printed clip-art directly into My Design Center. Use the included stylus to draw directly on the LCD display and see your designs or handwriting instantly spring to life in the large drawing area. No more tablet needed. 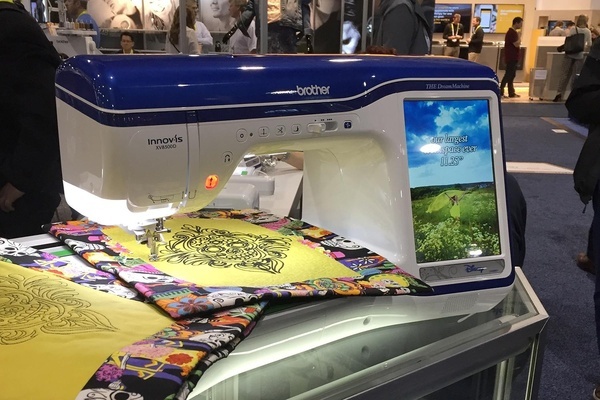 Use the industry-first lnnovEye® 2 Technology to scan handwriting or line art on the industry-first Scanlmation™ Scanning Frame, and then watch as they are transformed into unique embroidery designs. You can also draw directly on the 10.1" built-in HD LCD display. Use the industry-first lnnovEye® 2 Technology to scan an image or illustration on the industry-first Scanlmation™ Scanning Frame. Or import a JPEG using the USB port, and watch in amazement as the image is turned into stitch data using just the machine. Accurately stipple anywhere on any project. Simply scan your fabric using InnovEye® 2 Technology and define the stippling area using the stylus directly on the LCD display. Choose your desired stipple pattern and THE Dream Machine does the rest. You can also use the built-in library of shapes and patterns to add interesting detail to any project. You can even combine shapes and select inside or outside stippling to create unique designs. Use the industry first ScanImation™ Scanning Frame or draw directly on the LCD display to create your own unique patterns. Now you can get the look of complicated freehand stippling without the use of software or stitch regulation! No more puckering! Feeding fabric has never been smoother! Powerfully feed fabric from the top AND bottom, and sew precise, uniform stitches on a range of fabrics from silk to denim. The new couching foot with MuVit™ allows you to add cording techniques to your projects. Finish projects with embroidery and sewing speeds up to 1,050 spm. Plus, select decorative stitches now up to 710 spm. Sewing straight has never been easier with the built-in laser guide that creates a path to sew on. Now even easier with the brighter laser line for easier viewing on darker fabrics, and a wider range that extends up to 19mm. With double the brightness and manual adjustment, you will be able to see this guideline on any fabric you can imagine. Trying to guess where to drop the needle is a nightmare of the past! Use the embroidery foot with LED pointer to easily see your needle drop position - critical for embroidery. You can check the embroidery field easily with the trial key and the LED pointer. Also helpful while using the stitch forward and backward keys. Now with ± 1000 stitches forward or backward. The V-Sonic™ Pen Pal system uses ultrasonic technology to allow you to control several functions right on your fabric, so you can reduce the need to look away from your project. When sewing, easily make adjustments to needle position, set stitch width and position, select sewing end point, and set laser guide position. When embroidering, easily adjust the design if the fabric has been hooped crooked. No more babysitting your machine! Our revolutionary visual status system indicates when a thread color change is needed, what the next color is, as well as thread breakages and alerts. Originally designed for our PR-Series of machines. Can Your Machine Do This? My Design Center | THE Brother Dream Machine Feature Showcase. Watch how with My Design Center, creating new embroidery designs is as easy as drawing on the LCD screen. Video: Adding Satin Stitches and Stippling by Angela Wolf. Angela Wolf Blog: Filling shapes and designs with stippling or satin stitches has never been easier with My Design Center in THE Dream Machine by Brother. If you are using THE Dream Machine with Software Premium Pack 1 Upgrade or THE Dream Machine 2, you can now specify the hoop size and fill the entire hoop area with stippling with a click of the screen! Maximum Embroidery Area (X x Y): 9.5" x 14"
Added the ability to scroll thumbnail image screen for selecting an embroidery pattern. Enhanced the texture of hand-look quilting stitch. This update software provides the following changes. 1. Fixed some issues which may have occurred when the machine starts up. 2. Fixed some issues with the machine regarding the following features. - Scanning fabric to be used as a background with the Super Large Embroidery Frame. - Reading the pattern data from USB DVD/CD drive. Improved machine's functionality for reading the embroidery data whose file name contains characters other than the 26 letters of the alphabet and the numbers (0 through 9). showcasing beautiful built in designs, Disney and large 9.5” x 14” embroidery area. Fast forward to 2015 at the CES Consumer Electronic Show in Las Vegas. 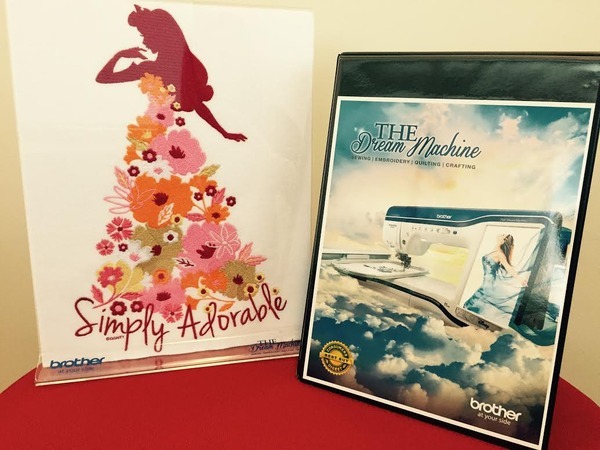 Brother Dream Machine is one if Digital Trends' Top Tech Nominees. Don't Accidentally Discard Your 9.5" x 9.5" Hoop! XV8550D - THE Dream Machine 2. As with all machines, you should be sure to thoroughly check all of the packaging prior to discarding it to make sure you have gotten everything out and all accessories have been accounted for. 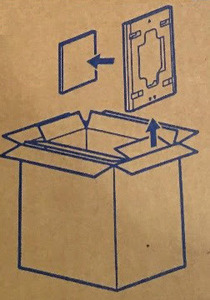 Please be sure to pay close attention to the top of the machine box as it will sometimes indicate special or concealed storage spots that accessories may be placed within the packaging. As you can see indicated in this photo from the top of the box for the XV8550D - THE Dream Machine 2, the 9.5" x 9.5" hoop is stored in separate portion of the box and is not placed with the other machine hoops.